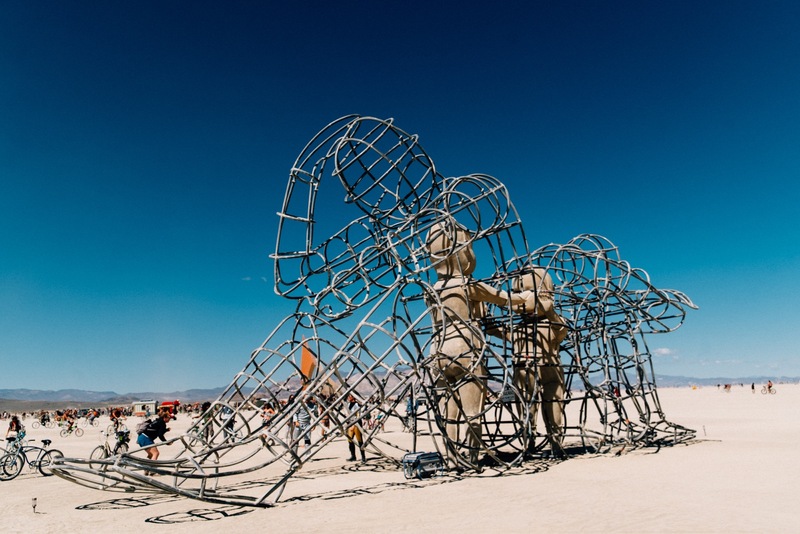 It's difficult to look at the art of Burning Man and not be filled with a sense of childlike wonder. 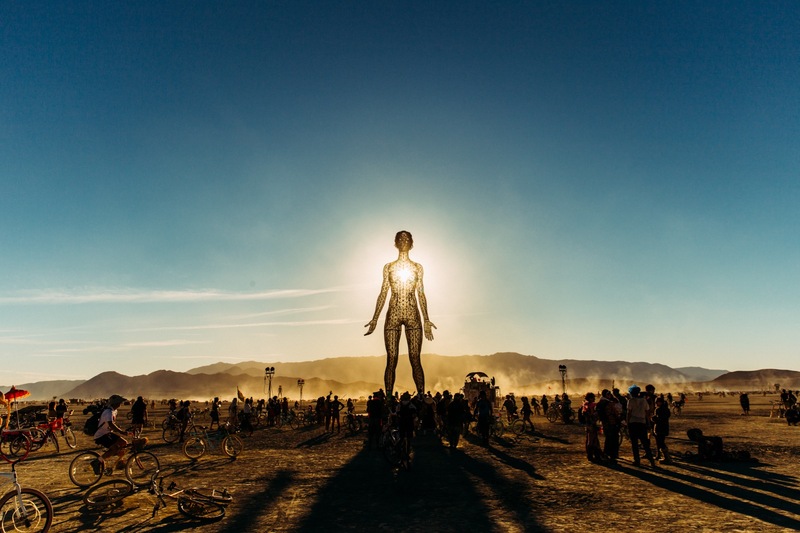 Larger than life, steeped in mysticism, and sometimes almost alien in form, the playa's installations give a playground-like sensibility to Black Rock City while serving as conduits for self discovery and inner exploration. Below are twelve of the most wow-inducing installations we saw this year. Medieval architecture had a spiritual purpose. After all, geometry is pretty much the basis of all life on Earth. It was this line of thought that inspired the geometrically designed "Arbour." The artist Joshua Haywood digitized geometrics and fashioned them into this contemporary structure to gain the same elevating effect, hoping viewers will feel compelled to gaze towards the sky and reach for the stars. 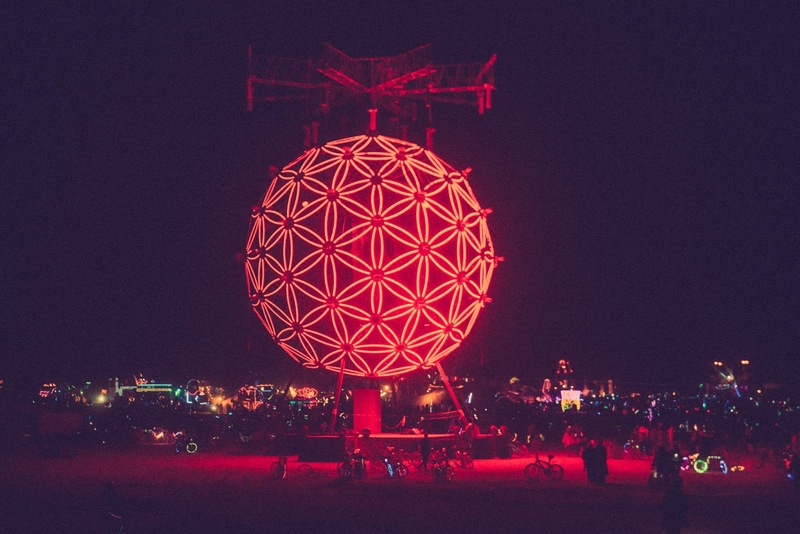 Full of cutting edge technology, THE BALL was an interactive Flower of Life sphere spanning an impressive 14 meters in diameter. Its commanding presence and size during the day gave way to THE BALL's unifying force as an interactive gathering point once night fell. It was installed with infared scanners which read movement around the base of THE BALL and translated the info into data that caused the light emanating to shift and undulate, making the piece look as though it was at times rotating like a gyroscope and at other times breathing. DREAM along with BE, OKAY and LIVE were 12-foot tall steel sculptures that were major landmarks for Burners all over the playa, perfect for climbing all over and posing against for pictures. 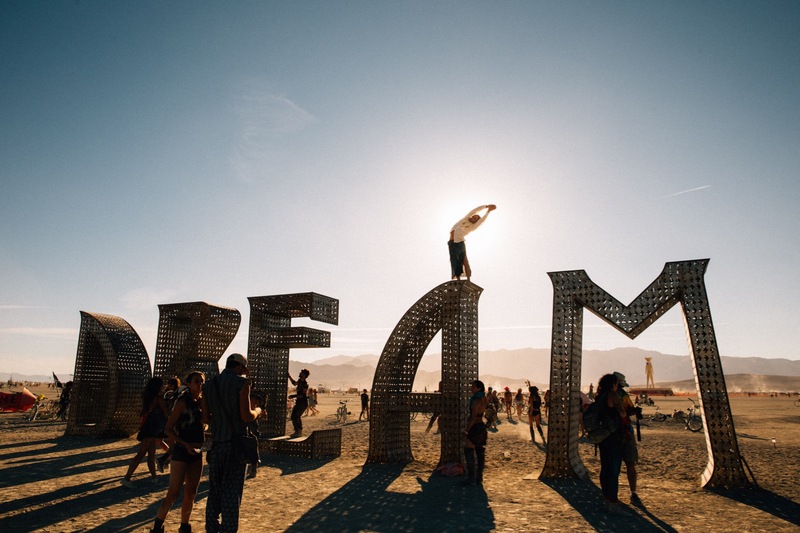 Burning Man's large letters, like BELIEVE which was just sold to the city of Reno have all been designed by me Laura Kimpton and built by Jeff Schomberg. 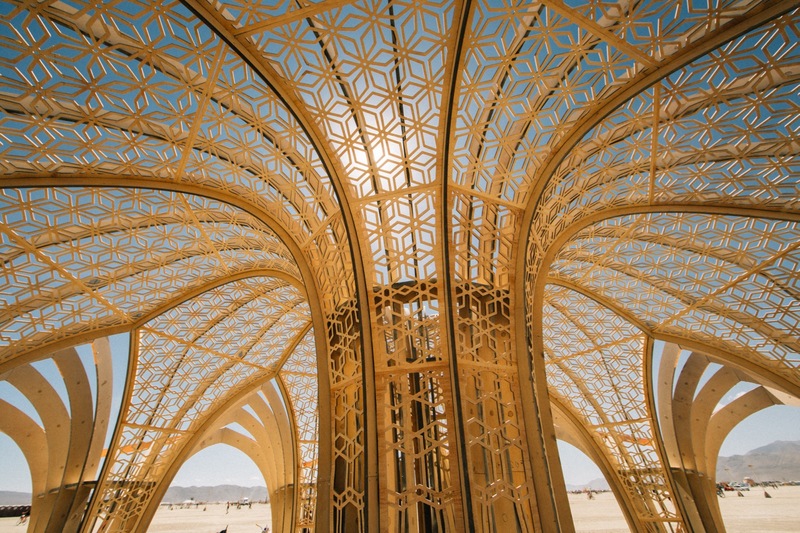 Compared with last year's HYBYCOZO design,"Deep Thought" is something even more intricate and sublime. "Deep Thought" was the centerpiece of this year’s Construction Zone, and took the form of a triambic icosahedron. 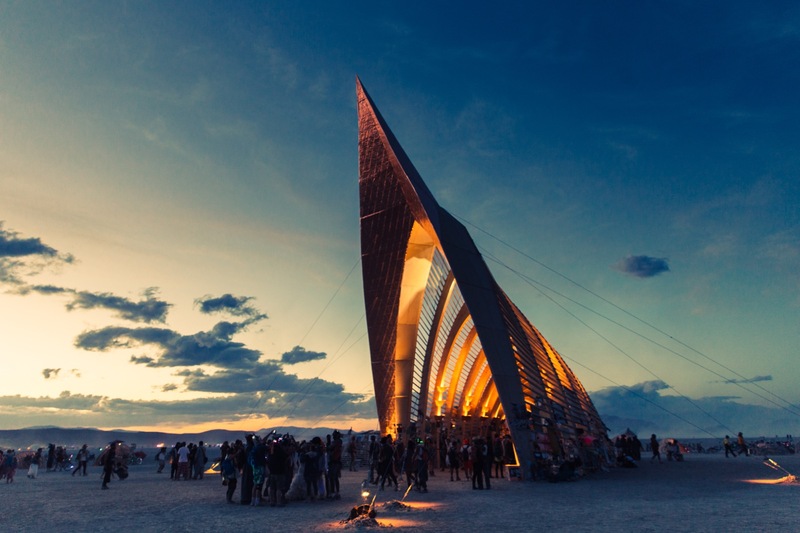 Let us explain: It's a complex 3D shape made of 60 gold laser-cut steel filigree triangle panels that cast colorful light and shadow far and wide onto the playa. 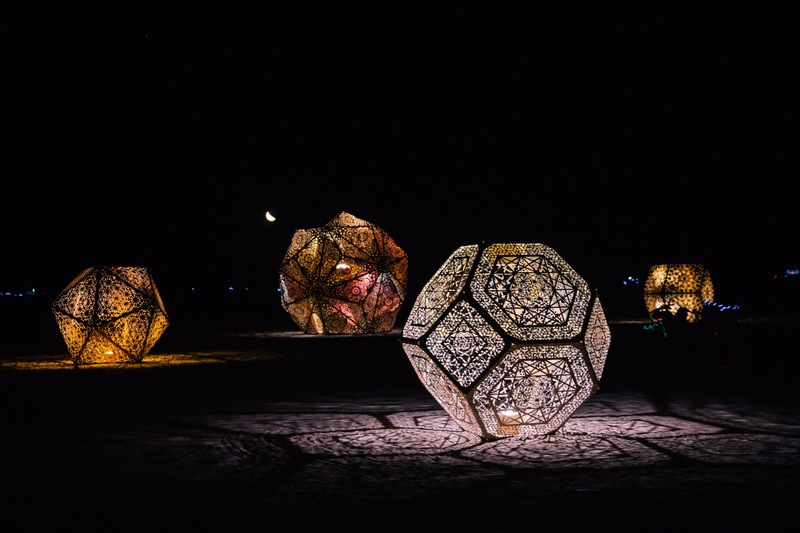 Artists Serge Beaulieu and Yelena Filipchuk created a place of refuge and wonder, a place of silence and a place of celebration, but most of all a place to lay down, stare up at a geometric sky, and contemplate all of the creation around you. 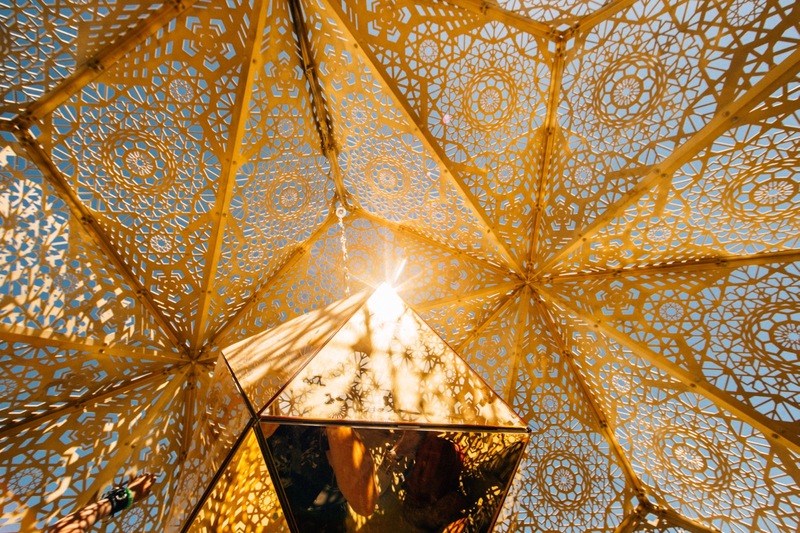 On the outside of "Deep Thought" forming an arc, other golden polyhedrons were placed to create a grounds for a mesmerizing community zone. "Who are you? What mask has society put on you that you continue to wear? Did you put it there?" 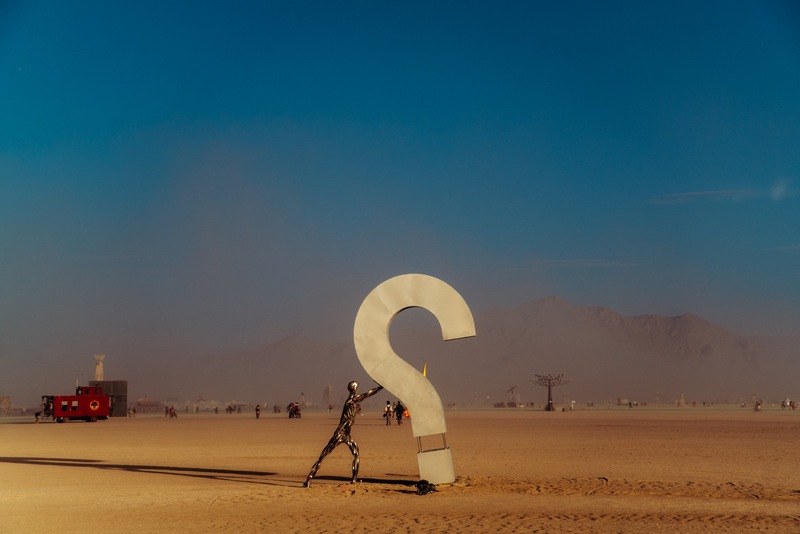 These are the questions "Identity Awareness" hoped to stir in each Burner who passed by it this year, in order to challenge what we think of as our identities within and without ourselves. 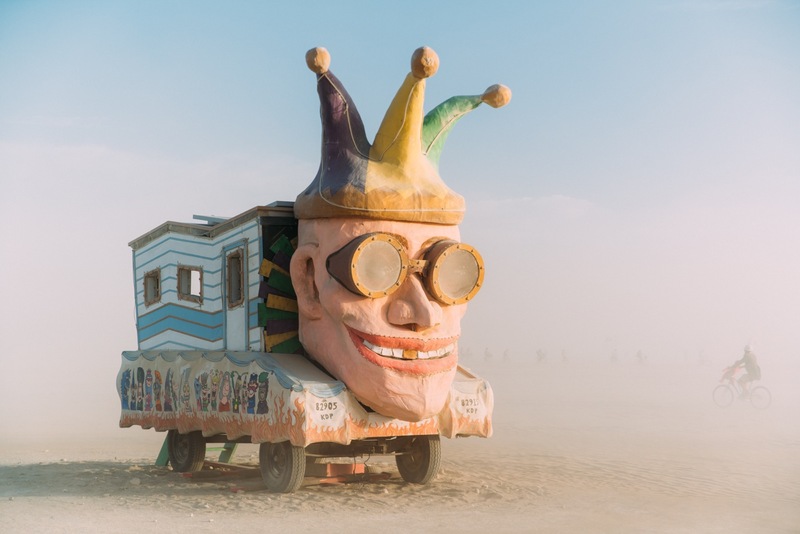 On the 10th anniversary of Hurricane Katrina, the Krewe of the Dusty Playa rolled out a Mardi Gras-style float that presented a humorous critique of the artist collective's two homes, New Orleans and Black Rock City. The float juxtaposed the symbols of the gentrification of NOLA neighborhoods with the plug-and play-camps that are at the center of much debate in the world of Burning Man. Made using traditional New Orleans papier-mâché float construction, it was constructed using many of the same techniques, materials and artists who carry on the tradition of Mardi Gras as members of New Orlean’s Krewe du Vieux. LOVE was a sculpture by Alexandr Milov. It signified those age-old conflict between men and women, as well as the outer and inner expression of human nature. The figure's protagonists are in the form of big metal cages, where their inner selves were captured. Their inner selves took the form of transparent children, who held out their hands through the grating. As night fell, the children began to shine, to represent the purity and sincerity that brings people together and forgetting old grudges. Just like you read about in grade school, Medusa is not to be stared at. Her presence on the playa dared everyone to stare at their own risk, lest you be turned to stone. 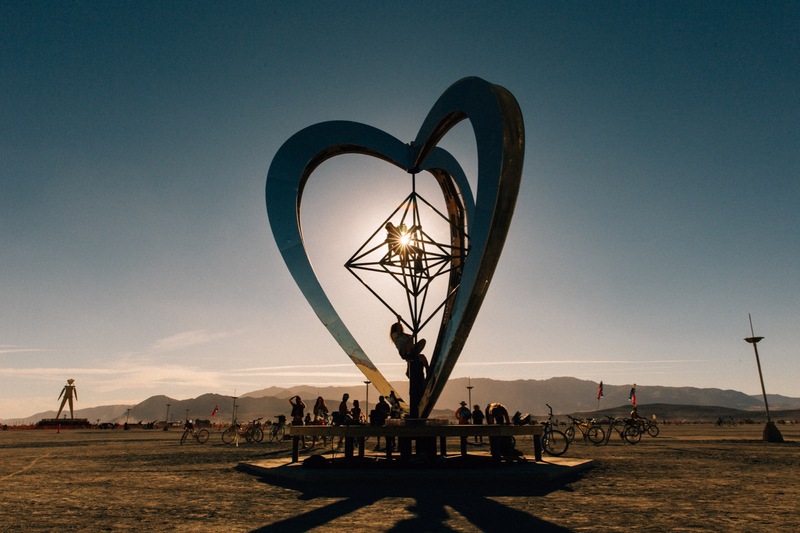 METAHEART was a mirror-clad, 3D heart form that rose 23 feet from the desert floor. In the heart of the heart was a geometric jungle gym, that rotated and moved under human power, and its sub-powered heartbeat kept pace with its rotating centerpiece. And at night, the lights came on. Computer-driven LEDs pulsated to the beat, and red red lasers – each at a 33 degree angle atop the sculpture – swept the night sky in synchronization. 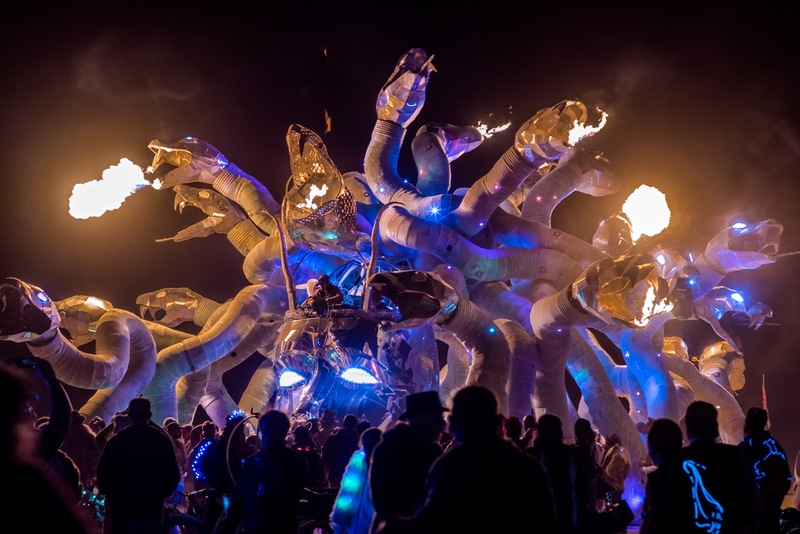 As loud art cars passed, audio-reactive light shows sounded across the desert. 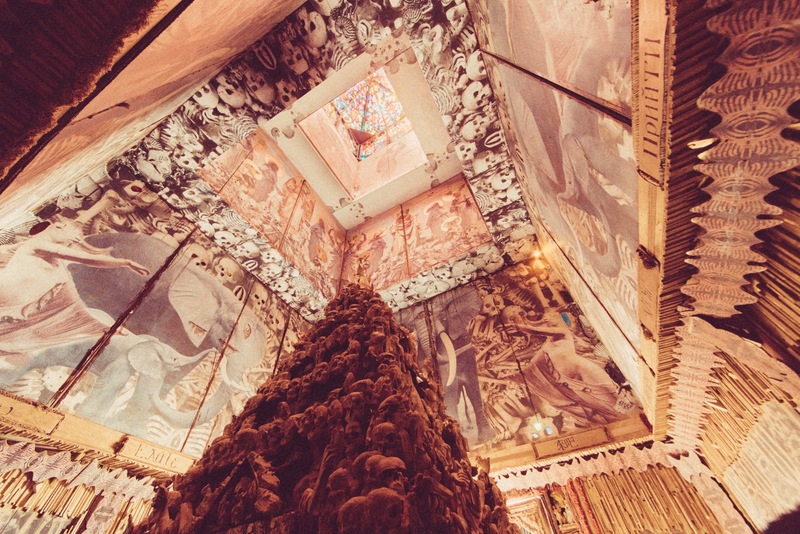 OWN WAY was represented by five heavenward stairways, each leading to a certain room. When you first entered, your destination was unknown. Intersecting stairways formed a pentagram, the most ancient and probably the most ambiguous symbol out there – meaning, it can morph and evolve to what we want it to signify to us personally as we go through life. Atop OWN WAY, a glittering rainbow connected the ground to the sky to form a sort of crown atop its head. 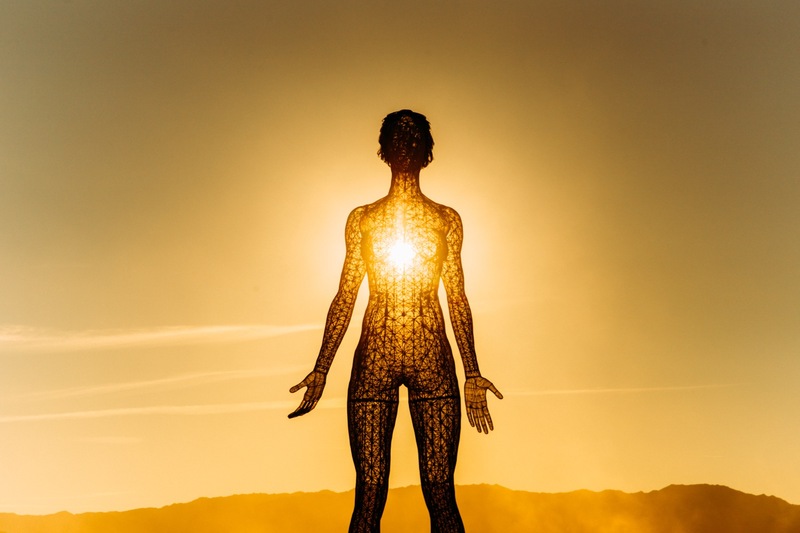 Constructed of steel rods and balls and covered in stainless steel mesh lined with LED lighting effects, R-Evolution was a 48-foot-tall sculpture of a woman, named Deja Solis, who stood firmly with both feet on the ground, eyes closed, arms open at her sides, palms forward, a peaceful expression. She was present. She was the culmination of The Bliss Project, a series of three monumental sculptures of Deja Solis, expressing her humanity. R-Evolution, like Bliss Dance and Truth is Beauty before her, was intended to be a catalyst for social change, to inspire men and women to take action to end violence against women, and to make room for women’s voices in society. She is intended to challenge the viewer to see past the sexual charge, the power and control that has developed around the female body, and into the human being behind the body. 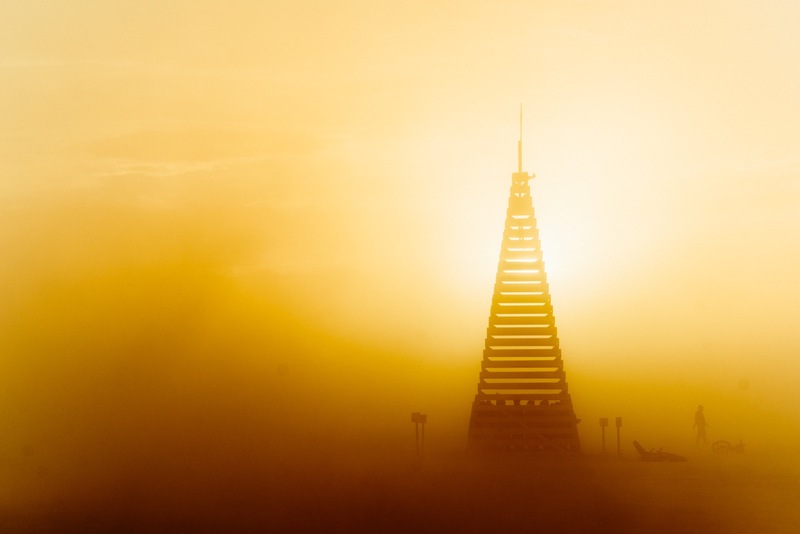 2,228 years after Archimedes was said to have destroyed an attacking Roman naval fleet simply using mirrors, Robert Marzewski brought the Sun Tower to the playa to try and set it on fire the same way. The 30-foot-tall climbable tower had a sun-shaped mandala at the top. Best of all, on Friday, hundreds of participants around the perimeter were given mirrors to reflect sunlight at the center of the mandala where a target wad of cannon fuse caught fire to set the rest of the tower aflame. A Temple’s purpose is to provide a safe space where the diverse and essential needs of souls can take root and grow, or surrender and find solace. 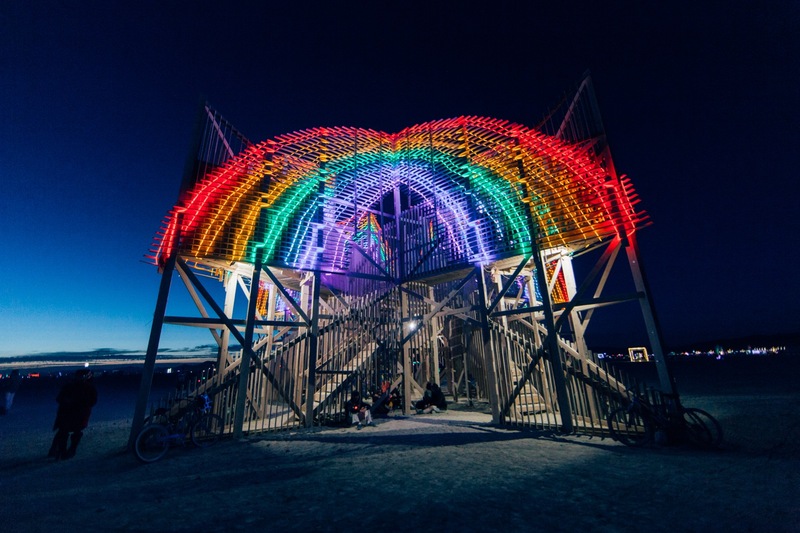 This year, the Temple of Promise welcomed participants through a 70-foot archway. Once inside, the structure curved in on itself like the inside of a shell, tapering in width and height down to just 7 feet tall. Along the way the sloping of the interior created altars and semi-private spaces for people to go solo or gather with friends. It opened into the contemplative altar and the heart of the Temple, which was a trio of sculpted trees. The branches, as in winter, were initially bare, but participants wrote messages on long strips of cloth and attached them to the trees, creating accumulating and calming amounts of shade. 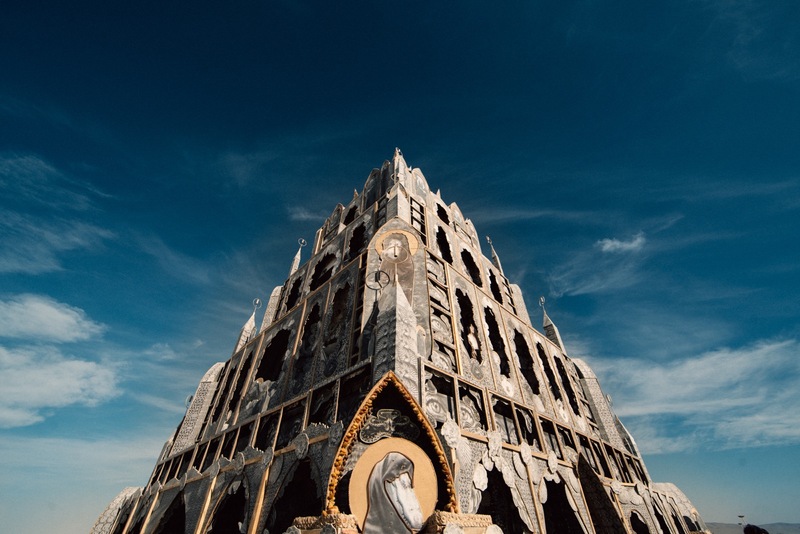 The mystical Totem of Confessions was Michael Garlington’s newest Chapel, standing 50 feet tall and recalling ancient Khmer and Vedic architecture made out of re-purposed mixed media. 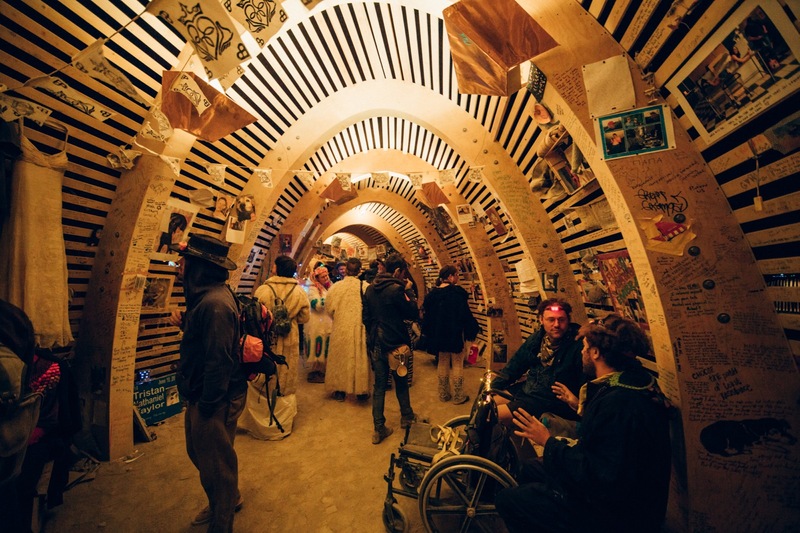 It was a zone to experience cathartic release on the playa and to discover concealed nooks and hidden compartments holding relics and gifts from Garlington's own hands. In the middle of the great room was a large confessional area, where individuals could find revelation and interact with the art and fellow participants.